Good quilt. It really is oversized. I got a king size for a queen size bed because I like to have a nice amount going down the sides and with this one, it's really big. My son loves it that way though. Got it for a teenage boy. The style (small sqares, straight borders) is simple and modern enough for a boys room. It feels soft almost silky to the touch. The weight feels similar to a cotton quilt, maybe a bit lighter, but it is made of polyester. It comes with 2 shams. The stitching is well done. I washed it on delicate cycle, cold water, no shrinking, no change in color. Dries pretty fast (I hang dried it outside). Nice tone of grey with bluish, not yellowish, undertones. It was delivered promptly. A good buy. 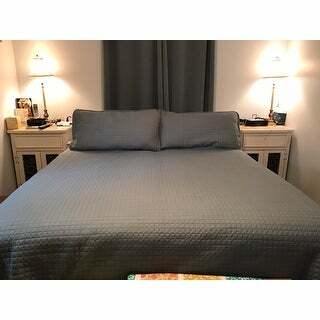 I got this as a summer comforter set and think it is going to work out well! Color as pictured. Soft, pretty texture. Great item! Quality is very nice! 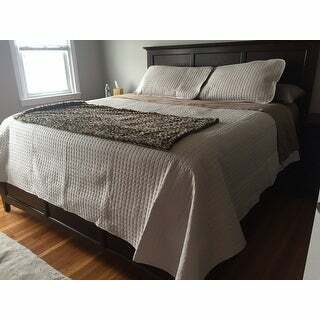 This quilt works perfectly for a double sized bed. Great quality. I wish the shams were a little bigger, but looks good on my double bed. I would definitely purchase again. Love Overstock.com for linens, purchase all of mine at this site! Soft and luxurious. Looks wonderful. Will likely purchase a second in another color. This is for a guest room where I wash frequently. It has held up well and pull directly from dryer, needs no ironing. Love this set! The quality seems good and the color is perfect.